Ward 1 staff provide an update on various heritage issues in Ward 1 and 2 including June 25 St. Mark’s open house and the Gore District. 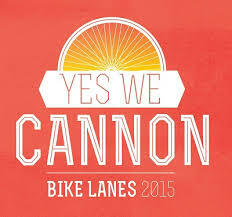 Learn more about the “Yes We Cannon” bike lanes campaign (and take the pledge), and the 1-way to 2-way conversion walkabout/audit for Queen and Cannon on Councillor Farr’s website. Residents have come together with Council Direction to determine the feasibility of converting Queen and Cannon from 1-way streets to 2-way streets. They have also begun to encourage the City to build bike lanes on Cannon in time for the 2015 PanAm Games. A renewed interest in Sustainable Transportation initiatives in Hamilton parallels the enthusiasn accross the Greater Toronto and Hamilton Area to make major investments in a currently inefficient and under-funded regional multi-modal transportation stystem. 1 comment on "Heritage Updates, Queen/Cannon 1-way to 2-way & “Yes We Cannon”"
I am all in favour of bike lanes, but I cannot understand this obsession with ridding Hamilton of one-way streets. Other cities, such as Portland, Oregon, seem to function perfectly well with a network of one-way streets, even in the charming downtown. What is the rationale for this? It is fatuous to imagine that converting our city completely to two-ways will solve its traffic problems. It certainly hasn’t in my neighbourhood.